This is a guest post from Carl Minchew, Vice President Color Innovation & Design at Benjamin Moore, the sponsor of Color in a New Light. 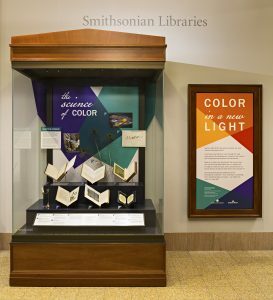 See Color in a New Light in the National Museum of Natural History before in closes in March 2017! Carl Minchew and Jennifer Cohlman Bracchi. As a paint company, we at Benjamin Moore take color communication very seriously. When we talk with designers, consumers, painters, or students about color we always start with the basics of light, reflective surfaces, and perception. Color in a New Light is a perfect fit for Benjamin Moore because it highlights a message we have been delivering for many years: color is light. 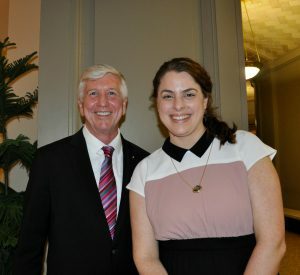 The Smithsonian Libraries is a unique and authoritative source for both serious scholarship and stimulating, accessible exhibitions that help expand understanding. As soon as we saw the prospectus for Color we wanted to be part of it! “Color in a New Light” in the National Museum of Natural History. We deal with painters, designers, and consumers who are professionally interested in color but it is obviously an experience that everyone shares, and it is often taken for granted. We are constantly surrounded by color, except in the dark or when we close our eyes (and even then sometimes), and it has a tremendous impact on our daily lives. We know color is important for identifying objects, signaling hazards, and communicating information, but it can also establish a mood for a space or work of art. Color can comfort us or provoke us. The better we understand color, the more we can understand and enjoy the world around us. It can all seem very complicated when we look at graphs and equations, but really, it is not so difficult. We knew the Smithsonian Libraries would find a way to tell the story in a compelling and understandable way. Color encourages visitors to be more thoughtful about color in their lives. By presenting a historical perspective, the exhibition emphasizes that color is a shared, cultural experience. It is those shared experiences that give color its impact and meaning. Whether it is the color of a recognized brand or of a traffic signal, our response is predictable, immediate, and powerful. 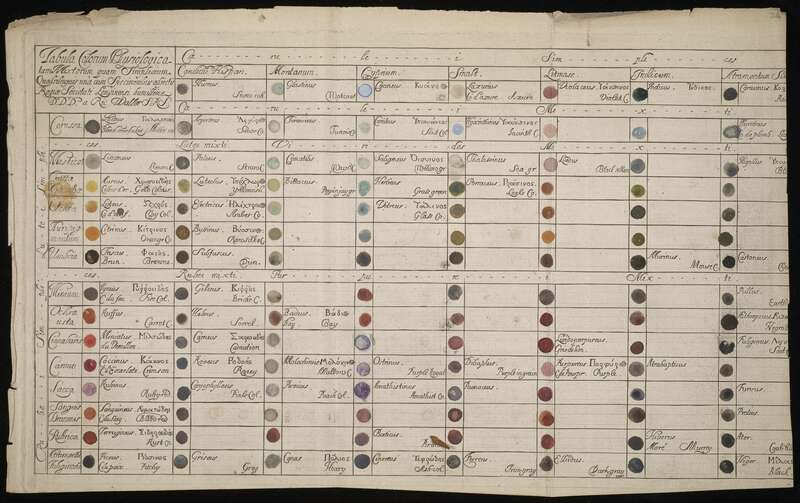 Richard Waller’s “Tabula colorum physiologica…” [Table of physiological colors]. 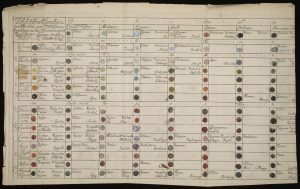 Philosophical Transactions of the Royal Society of London, 1686. We live in a fascinating time of change for lighting in our homes. The incandescent bulb, now more than 130 years old, is giving way to new technology like LED (light emitting diodes), which can fundamentally change our relationship with light—and also color—once the sun goes down. While incandescent lights are loved for their warm glow, they are very inefficient and really not very good at showing color. While we can brighten or dim incandescent bulbs we can’t do much to change the quality of light they produce. LEDs by contrast can be tuned to display a wide variety of lighting conditions, even mimicking incandescent bulbs or sunsets or bright sunny days. We are just at the beginning of this revolutionary change and don’t yet know what it might reveal about the colors around us. 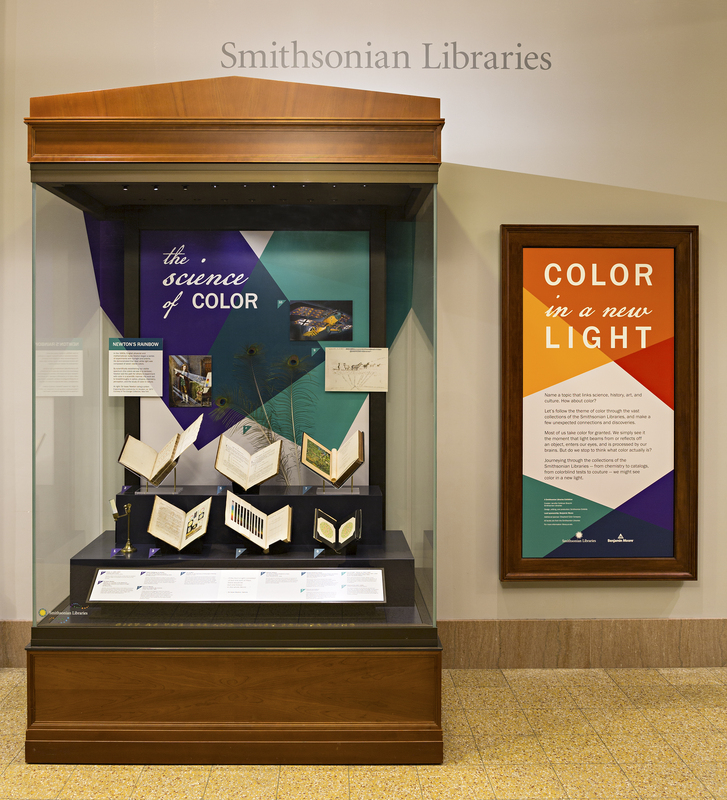 Benjamin Moore is very excited to help make it possible for the Smithsonian Libraries to introduce the story of Color in a New Light for a vast new audience!